Central photo: Mariposas de Aragón, 2017. Festival Internacional de Arte Urbano. Photo by Juanjo Fernandez. 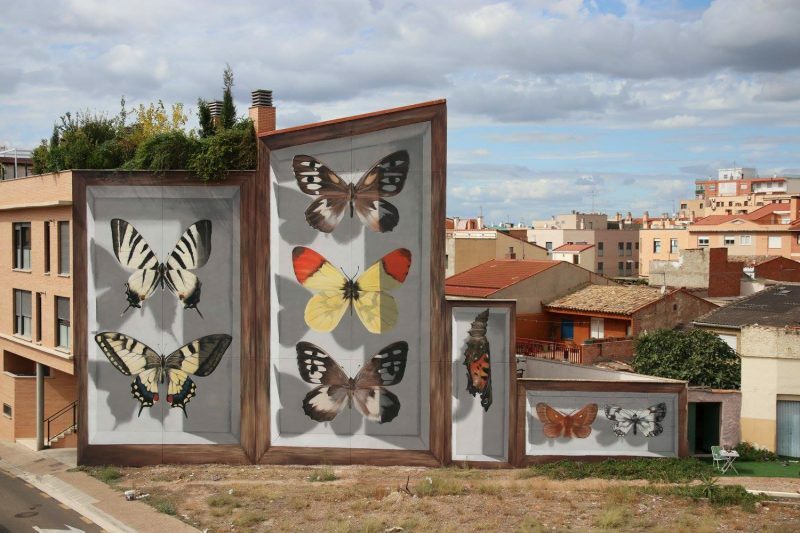 France-based street artist Mantra has been unveiling a series of trompe l’oeil murals that convert the facades of commercial and residential buildings into larger-than-life butterfly display cases in Spain, Austria, France, and Bogota. Seen here are a few pieces from the last year, but you can explore a bit more on Facebook. El asalto de Apollo, 2017. Saragosse, Spain. Yasuni’s Imago, 2017. Thionville, France. Collaboration with Stinkfish. Vienna, Austria.